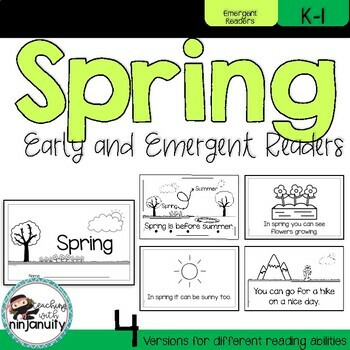 Each book has a cover, and 12 to 14 pages that cover different spring facts and activities and include a question page to help students write a response that helps them make a connection to spring. 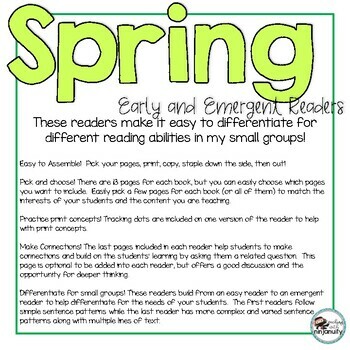 These are easy to differentiate for different reading abilities in small group reading. 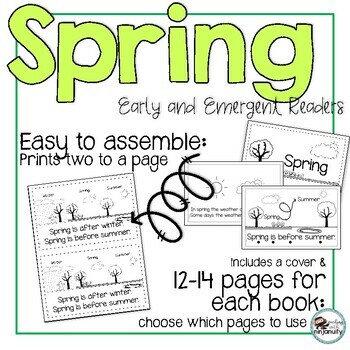 The books are set up to print two to a page and then easily print, copy, staple down the edge, and cut with a paper cutter! You can easily decide which pages to include from the set. Go to My Purchases page and look for the Provide Feedback button next to your purchases. Click this link to leave feedback. Each time you give feedback, TPT gives you credits that you use on future purchases! Click the green star next to my store logo to find out about new freebies, products, discounts and more! 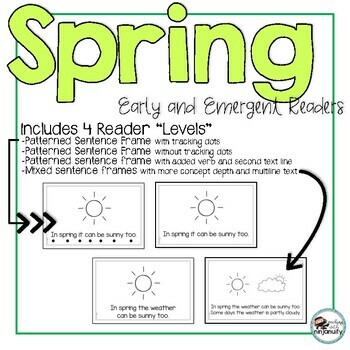 Thank you for visiting my store and checking out my resources! You can find out more about me, my classroom, and my teaching by following me!